Team Trust Constellations – "In Team We Trust"
8 hexagons which are based on Team Trust Canvas and describe the most frequently occurring factors that positively influence Trust in teams. 1 hexagon with “Coherence” which describes team ability to find directions. Several red hexagons with “Blockers” which can help model problems and obstacles. 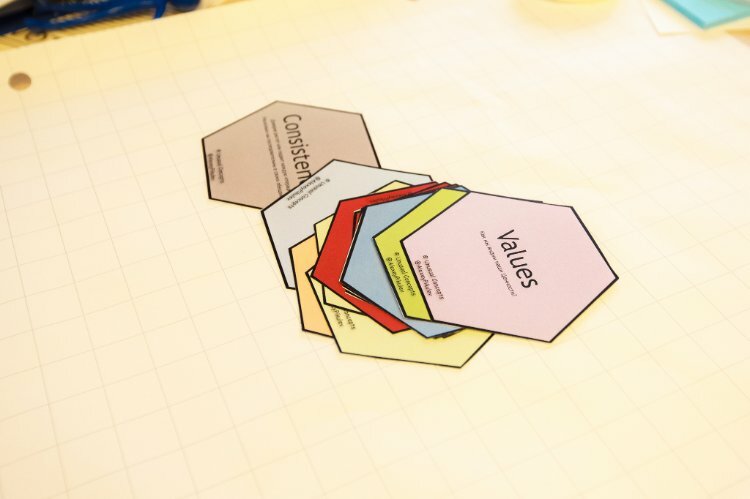 Several blank hexagons in order to give one the ability to find extra trust factors for participants. In addition, I added sticky arrow notes with different colors which could help us to model directions. Each team got a clear flip-chart which represented the team space. Then they received a set of hexagons and arrows in order to prepare a system map. I instructed teams. Their main goal was to find out how trust elements will adjust with each other and form a Team Trust Map. They should make an effort to discuss and find a solution as a team. Optionally, they could draw a team boundary or other extra elements and shapes which can help them to build a map. Working with a clear flip-chart they choose the first hexagon which could represent their most important factor. Then they find an appropriate place for the starting point for their trust conversation. The next step, they choose an arrow and find a direction which demonstrates a connection or influence to their next factors. If it was necessary they might mark an arrow in order to clarify the links. Choose another hexagon and do the same thing. If the team feels that they will meet an obstacle at this point they might put a “Blockers”. As a result, teams will create a visual Trust Map. They can use it as a blueprint in order to organize and provide some changes. Another point, the Map leads to deeper understanding of team trust, which opens new opportunities and gives fresh energy to the whole team.